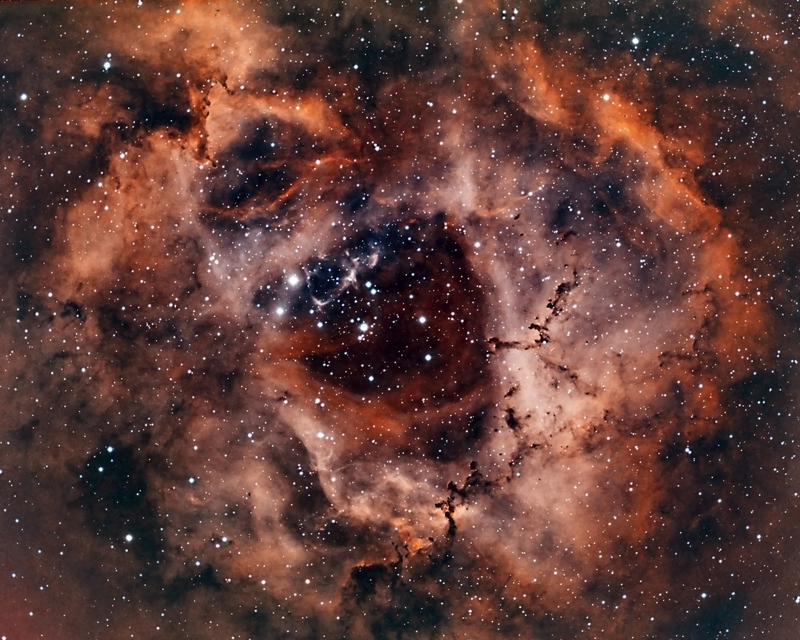 This entry was posted in Astro and tagged Monoceros, Nebula, NGC 2237, Rosette, Rosette Nebula. This entry was posted in Astro and tagged Rosette, Rosette Nebula. 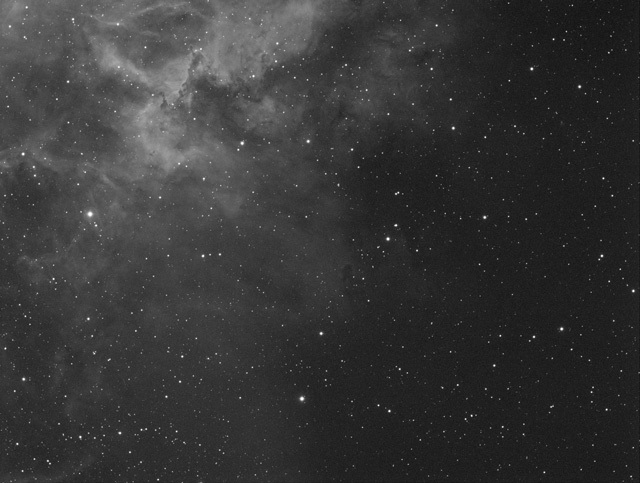 My imaging field of view is 1.37° x 1.03° (more on this here), which is very limiting when targeting large nebula. 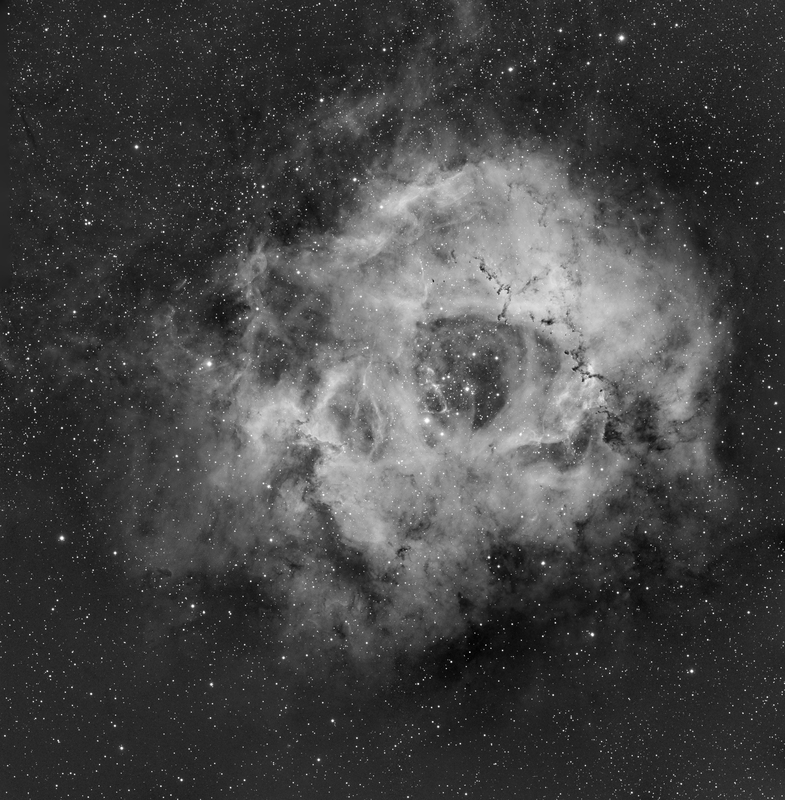 As you can see below, My image of the Rosette Nebula is too contained. 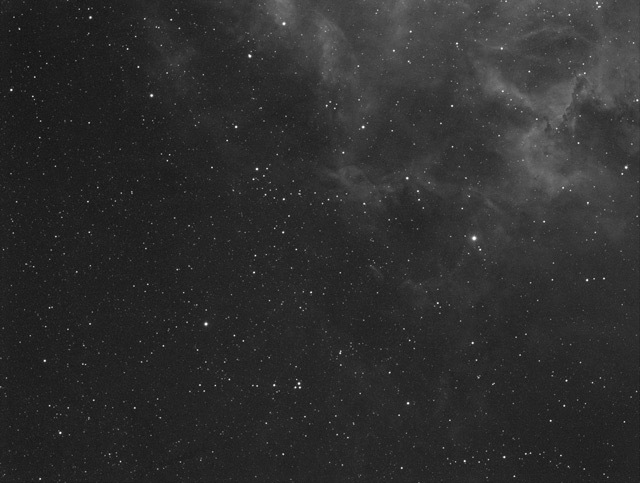 The nebula has no room to “float” in space. 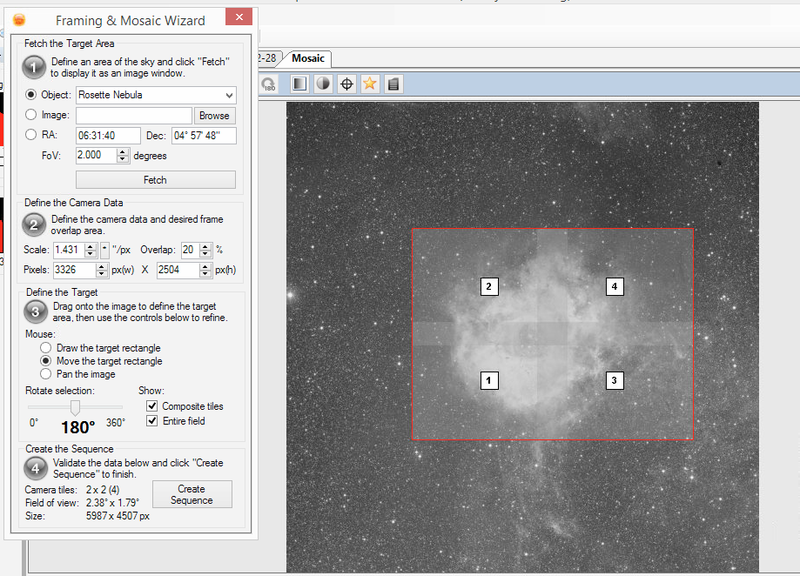 I wanted a 2°x 2° image so my options were either a smaller telescope or a mosaic. 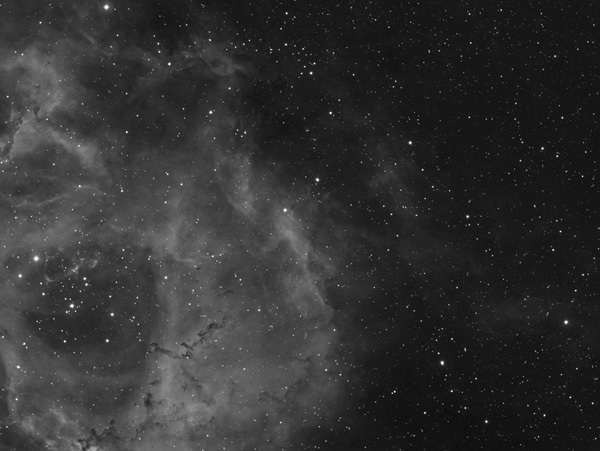 If you are new to astrophotography, I strongly recommend you start with Starizona’s guide to imaging. To create the 2°x 2° mosaic of the Rosette Nebula in narrowband I used Sequence Generator Pro‘s Framing and Mosaic wizard. With some rotation, I was able to fit nebula in the 2×2 frame mosaic. Light pollution: Bellevue is a city. Is rank 7-8 in the Bortle Scale. For a light pollution map go here. 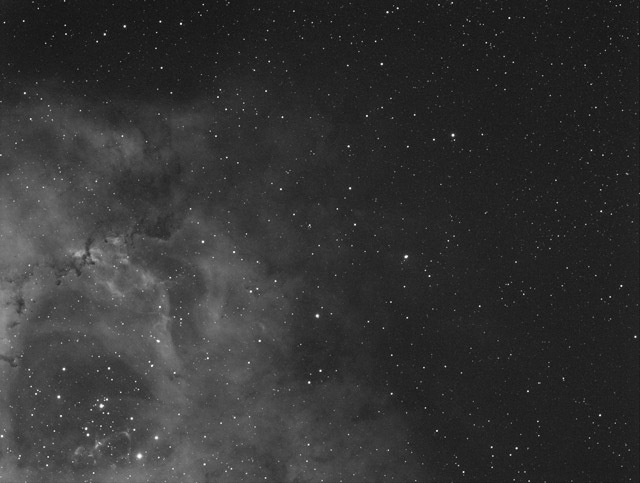 For a great article about the effects of light pollution on astrophotography go here. 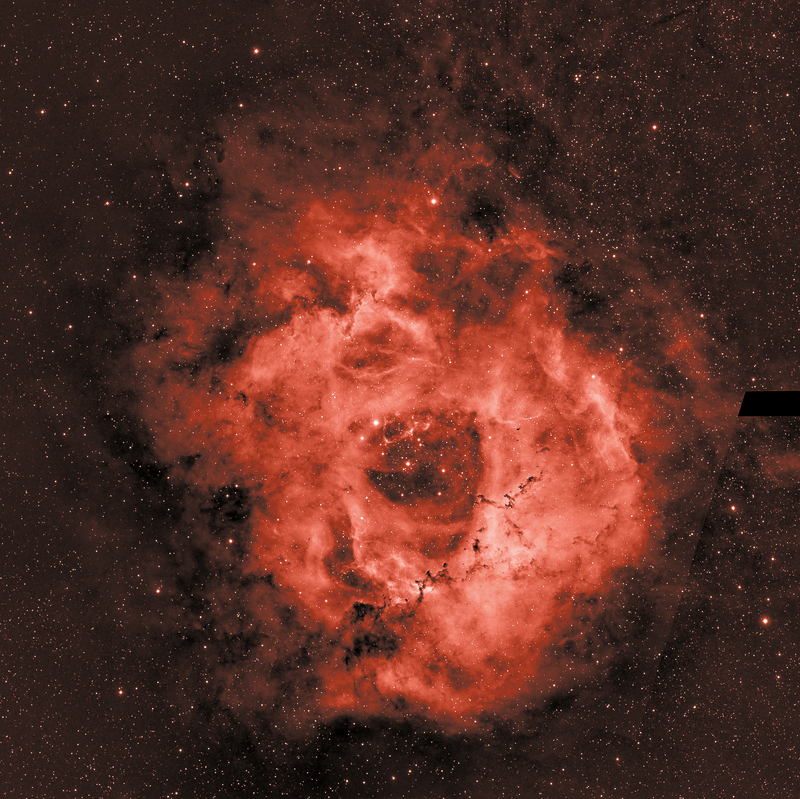 I will be using Narrowband filters Ha, OIII and SII. 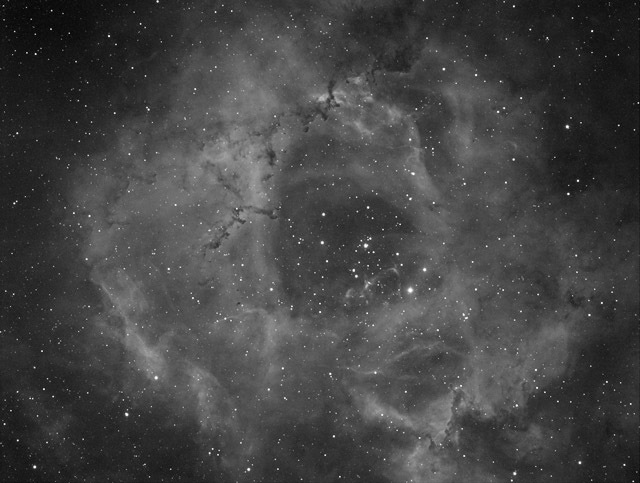 In previous attempts I had good results with 20 minute exposures in Ha and 30 minute exposures in OIII and SII. 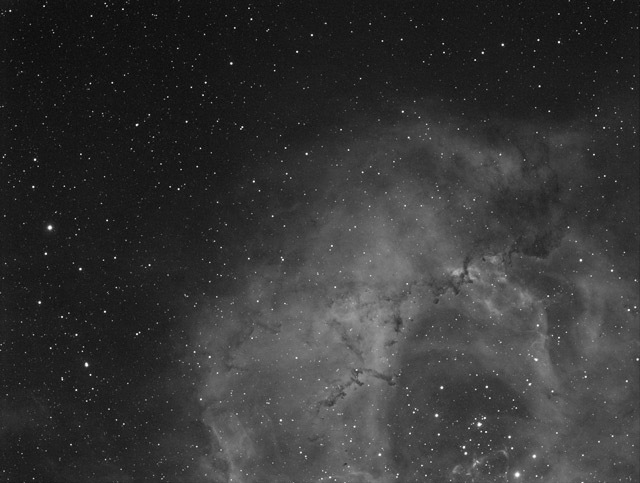 Time, time, time: In the section above I determined that I have a 5 hour imaging window. 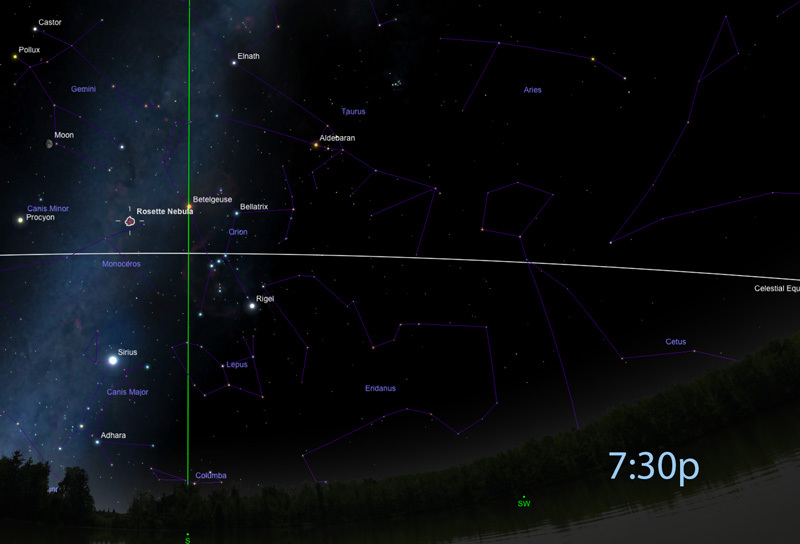 Prior to the first image of the night, the telescope has be focused, find where it points to the sky, calibrate its autoguider, then slew to the target, center, rotate, focus again, wait for the autoguider to settle and then start imaging. That routine averages 10 minutes and takes away from pure imaging. 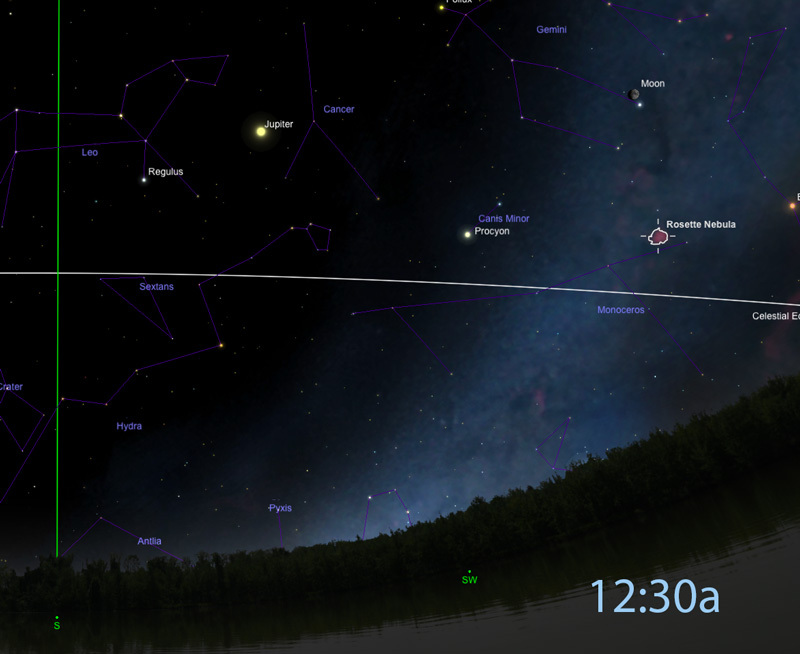 Another time sink is a meridian flip, a maneuver by the mount to reposition the telescope on the target when it crosses the Meridian. After a flip which usually takes 2-5 minutes all the startup steps apply so the overall cost is 12-15 minutes. That cuts the imaging window to 4 hours and 30 minutes. The minimum number of imaging sessions is 8 nights. That is… 11 clear February/ March nights in Seattle. 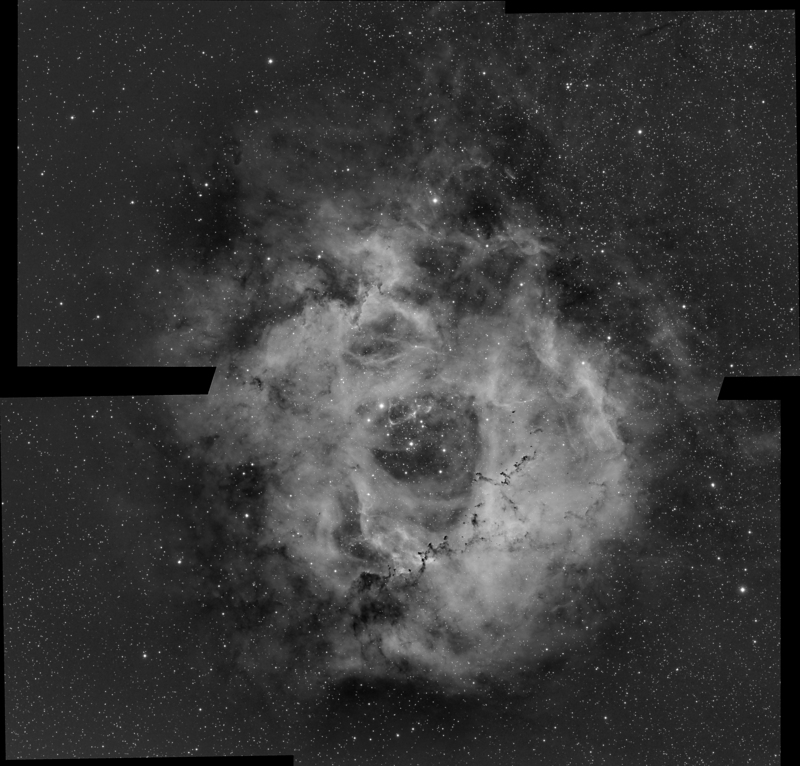 This entry was posted in Workflow and tagged Rosette Nebula. 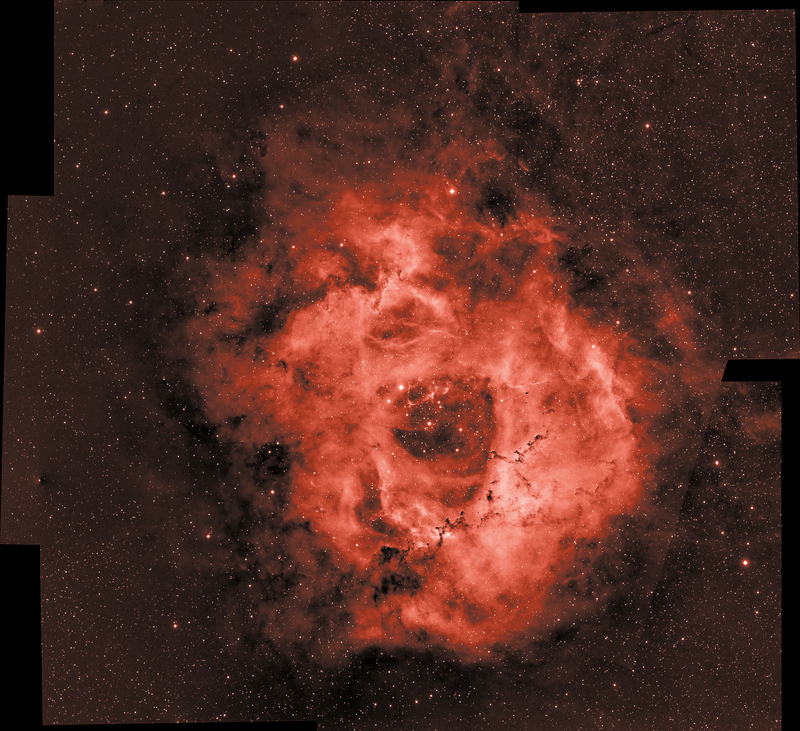 This entry was posted in Astro and tagged Nebula, Rosette Nebula.